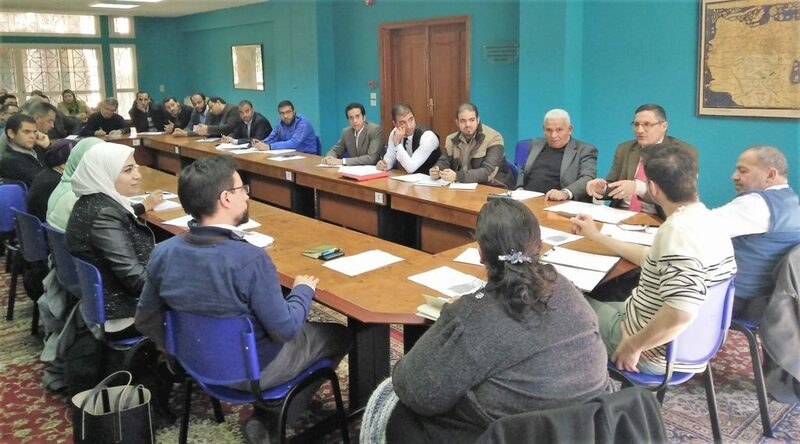 The first meeting on the question of extremism, organized as part of the collaboration between al-Azhar and the IDEO, took place. The selected topic was: “Extremism: History, Definition, and Diagnosis”. The Seminar was in French, and the morning’s work was followed by a lunch at the Priory. Mohammed Ashraf (PhD student at the Men’s Faculty of Languages and Translations) presented several definitions of “extremism” from dictionaries and anti-radicalization centers. The extremist is convinced that he has the absolute truth, and is ready to use any means to impose it. He shows an inability to accept other opinions, and questions socially accepted norms. Extremism is therefore a relative phenomenon. What is considered extreme in one context will not be considered extreme in another. Any reform is extremist, in the sense that it calls into question a social and religious balance. As he disrupted the social balance of Mecca, the Prophet can be described as an extremist. The problem of extremism is therefore not so much its potential for reform, but rather its potential for violence. Pacynthe el Hadidy (Teaching assistant at the Women’s Faculty of Human Sciences) raised similar questions: if extremism consists of distance from a center, who defines that center? Every doctrine generates its extremists, whether in politics, economics, or religion. The main problem of extremism is in taking violent action. However, even in this case, everything is a question of perspective. The resistance fighters of some are the terrorists of others. The extremist who commits a violent action feels authorized to do evil for a higher good. The potential for violence in extremism often rests on the dehumanization of the adversary, a refusal to engage in dialogue, a sense of helplessness, or a disappointment about the state of things. Guillaume de Vaulx (Researcher at the IDEO) choose a more philosophical approach. He started from the following definition of the concept of extremism: “deviancy from a social norm that is made in the name of the norm itself”. This definition contains within it the following problem: how does one fight against this deviance which claims to be the most normal? Denunciation of the extremism of the action (the value which serves as this standard is not affected). Denunciation of heresy of the interpretation on which it is based (the orthodox interpretation of the value which serves as the standard is specified). Denunciation of the value itself and social revolution recasting the norms. Thus, in nationalism (returning to the example used by Pacynthe), we can ask: is the murder of Isaac Rabin simply an extremist action? A religious Zionism as opposed to the secular Zionism of its founders? Proof of the very invalidity of Zionism itself (and of any nationalism)? A philosophical questioning followed this sociological analysis. Regarding the first attitude, extremism means that values are not ideals, but rather middle paths. Here we find the opposition of Aristotelianism against Platonism, which entails that the value is not a good in itself, and that we should not cultivate it intensely. Whereas beauty, truth, etc. are absolutes to which we are to seek, without a possibility of excess. In short, value is devalued. Guillaume calls us to start our working sessions from these ideals (i.e. truth, piety, etc. are to be considered absolutes). The next meeting is scheduled for Saturday March 25, at 10 a.m. at the Faculty of Languages and Translation.